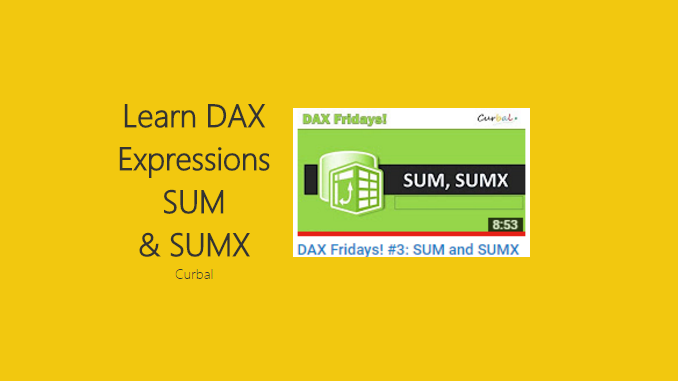 Learn how to use SUM() and SUMX() with this great video from Curbal. As you become more familiar with PowerBI you will increase your understanding of DAX (Database Analysis Expressions). Microsoft has an extensive list of all the expressions you can use found here. One of the more common expressions you will use is SUM and SUMX. To learn more about DAX I have read both of these book and found them extremely helpful. They both cover the basics and then quickly get you understand how to make complex calculations which you will need to make the right visual work. Curbal has been generating a lot of great content. To learn about for more information you can visit the website found here, or visit the YouTube Channel.